I fell in love with kimchi several years ago when an old boyfriend took me to his favorite Korean restaurant in Boston. I was a vegetarian at the time, and so was less-than-enthralled by the array of char-grilled meats before me (don’t worry, I have since seen the light), but I was enraptured by the seemingly endless little bowls of condiments and nibble-ables, the tastiest of which, I thought, was spicy fermented cabbage or kimchi. Since moving to San Francisco, I’ve been buying kimchi for some time, always too intimidated to make it. Finally, after a Korean friend clued me in that it’s actually pretty simple to prepare at home, I decided to stop dropping $6-$10 every week on my beloved kimchi and learn to make it myself. I adapted this from David Leibovitz’s reliable recipe, making this one purely from cabbage and not also daikon and green onions as he did, but I’m thinking that maybe next week I’ll try adding them in for a little variety. Note: Hit up your local Asian grocery store for the best variety and prices on cabbage, Sambal Oelek and fish sauce. 1/4 cup Sambal Oelek or Korean chili paste $2 for 8 oz. 1/4 cup Asian fish sauce $2 for 16 oz. In a very large container (or smaller containers) dissolve the salt in the water. Submerge the cabbage into the salt water and weight it down with a plate or frying pan (so it stays submerged). Let cabbage soak for 2 hours. A few minutes before the cabbage finishes soaking, combine the minced garlic and ginger, the Sambal Oelek or Korean chili paste and honey in a large bowl. Stir well to combine. Once the cabbage has finished soaking, drain, rinse it and squeeze it gently to remove excess liquid. Use your hands (wear gloves or use tongs instead if you have any open cuts as the chilies and garlic can sting) to thoroughly incorporate the chili mixture with the cabbage. Pack the kimchi into a 24 or 25 oz. jar (I used an old, scrubbed-clean tomato sauce jar) and screw the lid on tightly. Set in a cool, dry place, out of direct sunlight (my pantry worked well for this) for 3-4 days. After 3 days, open the jar and look for tiny bubbles. If it’s begun to bubble, it’s ready to serve or to be refrigerated. If it hasn’t yet begun to bubble, leave it for another day. After 4 days, you should notice a few tiny bubbles throughout the jar and can either serve your kimchi or put it in the refrigerator. 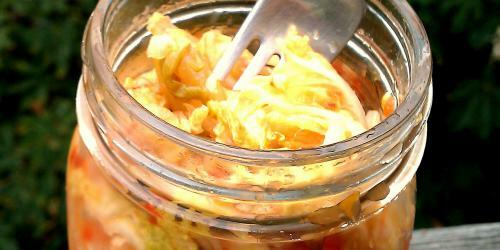 The kimchi will continue to ferment in your refrigerator. I find that after 3-4 weeks, it’s a bit too fermented for me, so I try to eat it within that time (it’s usually gone before then anyway). Makes about 22 oz. kimchi. Loved that kimchi in those nori rolls from the other day. for the korean chili paste…do you mean kochujang? interesting recipe…i will have to try it out. I have been LOVING your recipes, and my friends are loving them/reaping the benefits (they are eager “lab rats” and also broke, but they bring me ingredients from the farmers market/Polish butcher to experiment with, so it works out well). Tomorrow I am making your kimchi and I am so excited; nearly every week I get a jar of it and it’s so expensive at my grocery store, so this will save me a lot of money. I read that you’re a runner — I am too. I also read about your movement away from carbs. I carb-load before my distance runs — how has cutting them out affected your running (if at all)? I’m curious — that’s what’d keep me from doing it. i am making this for the first time. i want to add green onion. do i put it in the salt water with the cabbage or add later when i mix? great post really i like it thanks for sharing it . You will be really very thankful to the author’s website as you will be able to get the free membership for club penguin as you will enjoy a lot in playing this game. I really appreciate this awesome blog i am very glad to share this. i think you should have a great website. The new recipe of the kimchee you shared that here this is really looking outclass one buddy, with the messing of that we can get the enjoyment of the kimchee. The ingredients are very delicious and easily available. This is very important game this site is very simple play. https://jualviagraasliusa.com/(WA : 081383777147) Toko Online Jual Obat Kuat Viagra Asli Pfizer USA 100mg di Jakarta,Pasti Puas Belanja di Sini Makanya Ayo Beli Sekarang Juga. I have been in love with your all recipes because they all are very delicious. Thanks for sharing your work wit us. All recipes are very delicious thank for sharing a wonderful kimchi recipe. Your blog is fabulous, superior give good results… Seen a large number of definitely will understand everybody even in the event they do not take the time to reveal. thank you for sharing for your information, I am happy to visit here. please visit my simple website. secret artist news all over the world. Great! I love kimchi and have spent days and hours making it. I’ll have to give this a try! Kimchi provides a lot of fibres and vitamin c but is high in sodium. Balance it with plain rice and broiled fish or any lean meat, and for a feeling of fullness, a broth-based soup. Visit here to know about getting of free robux. Your blog is good and gives you a better result. Even if they do not take the time to attend, they will see a lot of people who will definitely understand. I’m an experienced Assignment Writer Online and I love reading blogs on cooking. It should be noted that whilst ordering papers for sale at paper writing service, you can get unkind attitude. In case you feel that the bureau is trying to cheat you, don’t buy term paper from it. Love to see that someone has actually experienced the delicious taste of Korean foods, Interesting blog though, Cheap Dissertation Writing Service in UK would love to read more from you. Adam Hebrew has been a very reputed and 100% unique homework helper in one of the college/universities in the United Kingdom. He has been associated with Myassignmenthelp.co.uk for the last four years and he is one of our reliable partners in homework help for Uk Students. He has got his master degree from Cambridge University. Avail our services and get your dream to score high grades fulfilled. Homework are very complicated and pose a lot of struggle for the students. Your post is really good information. I liked its and enjoyed reading it. Keep sharing such important posts and looking for hip hop. SA Islamabad Car Rental Company has been working for quite a while and it is incredibly conspicuous among Companies, Individuals and corporate as “lease a vehicle in Islamabad”. We offer most affordable rates and pleasing rides to associations additionally on step by step, step by step, month to month and yearly reason on pitiful lease a Car Mission. I do not hear the name of Kimchi. Well, from the ingredient and the photo, i can say that I need to try at least one time.